The Jain Society of Metropolitan Chicago was established in 1970 and currently has a membership of approximately 1,500 families, the largest of the North American Jain Centers. Its mission is to offer a trustworthy and structured ground for projecting the common voice of all Jains for the promotion of Jain principles, providing Jain education to the community and celebrating Jain social and cultural events in a compassionate, vibrant and dynamic manner. 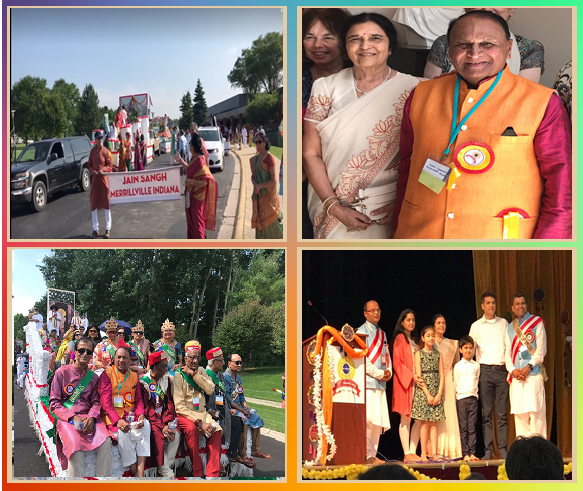 From June 22 to July 1, the Jain Society of Metropolitan Chicago (JSMC) celebrated the 25th Anniversary of its temple, with great enthusiasm at Bartlett, IL. About 4000 people from the US and outside witnessed this 10 days of historical celebration. JSMC is the first Jain temple in North America with Shikhar or dome to complete 25 years. A number of dignitaries, speakers, and faith leaders from US and India graced the occasion. The political dignitaries including Illinois State Governor Bruce Rauner, Consul General of India Ms. Neeta Bhusan, US Congressman Raja Krishnamoorthi and Peter Roskam, State representatives Christine Winger and Laura Murphy, State senator Tom Cullerton, and Bartlett Village trustees had graced the event. The 1.5-mile parade & procession was one of the highlights of the celebration, which had started from Bartlett’s Eastview Middle School and ended at the Jain temple. Despite nearly 100 degrees temperature, the parade had participation from more than 1000 members. Activities like a sports day, field day as well as youth-focused seminars and shibirs kept the youth engaged. JSMC also created history by inaugurating the first memorial (Jeevant Smarak) of Gurudev Chitrabhanuji who has strengthened Jainism and united Jain community in the US in the last 40 years. 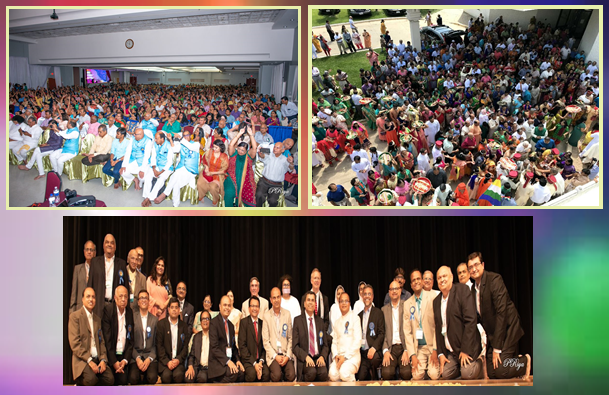 Last week, Jain Center of Metropolitan Chicago completed its 25th-anniversary celebration with various events such as Pujas, Sthapnas, Pujan, Plays, Cultural Program, Raas-Garba, Bhaktis, Pravachans by dignitaries like Shri Jinchandraji, Shri Rakeshbhai Zaveri, Shri Tarlaben Doshi, Shri Kumarpal B. Desai, Shri Shrutpragyaji, Keynote addresses by Dipak Jain, Sajan Shah, Rahul Kapoor, Shri Pramodaji, Float procession ceremony, Bust inauguration of Gurudev Chitrabhanuji etc. JSMC had also organized youth activities like sports day, field trip, plays, pravachans and more. Here are some photos from the ten days of celebration. To build, sustain, grow the message of Jain religion and practice it for last 25 years is a big achievement for Jain Society of Metropolitan Chicago (JSMC). JCMC is truly blessed to have Mulnayak Shri Mahavir Swami, Shri Shankheshwara Parshwanath Dada and Shri Aadeshwar Dada presence in its temple. The completion of 25 years of the first Shikhar Bandhi Derasar of North America is indeed a milestone for every Jain in North America to celebrate. JSMC is bringing forward a grand 10 day Mahotsav of 25th Pratistha Anniversary from June 22nd to July 1st 2018. The celebrations cannot begin without blessings of our Guru’s and Pracharaks who have kept the preaching of Bhagwan Mahavir alive and helped us in following their path. Many dignitaries are will join the Mahotsav. Visit www.jsmconline.org to know more about the celebration. The Jain Society of Metropolitan Chicago (JSMC) saw continuation of social, community and religious activities in the past month. In Feb we had a very successful JSMC Bowling event where over 96 enthusiastic bowlers participated with friends and family. The entire Bowling Alley was reserved exclusively for JSMC. Along with unlimited bowling, participants enjoyed Hot Indian breakfast with Masala tea, Indian Music and Fresh Jain Pizza. The fun event was followed by JSMC SEVA Day on Mar 4thwhere more than 100 volunteers, JSMC Staff and JSMC ECBOT gathered to help with Cleanup and Organization at JSMC. This community event was an exemplary showcase of team work and synergy. We organized JSMC office, Technology Center, Poojan Samagri Room, Prayer Halls, Green rooms, Main storage area, Kitchen facility, Food Storage area and many more. It was a very humbling experience to see the dedication and commitment of all JSMC Members who worked very diligently, wholeheartedly and gave their best efforts. March continued with Fagan Sud Teras celebration from Fri Mar 10th to Sun Mar 12th. We had arranged for Pat Darshan so that members can do a 6 GauBhaavYatra of Shri Sidhdhagiri. Though January is marred with cold weather in the Midwest but come to Jain Society of Metropolitan Chicago (JSMC) and you will find it bustling with activity. At JSMC we started the year with our Semi Annual Pratimaji Sudhdhikaran Project where close to 30 volunteers came together under the leadership of our Religious Secretary. The team cleansed Pratimaji’s of Tirthankar and Dev-Devi’s as is traditionally done in India. The month progressed with 50 members of JSMC committing for a better health by joining the 8 week Yoga Training Session conducted at the JSMC Center. 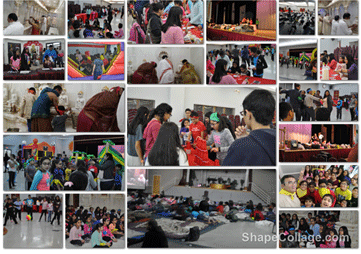 The month ended with the most awaited youth event of winter, JSMC Lock In. More than 155 kids from the age group of 8 to 15 participated in the JSMC Lock In event where the kids stay overnight at the JSMC center. The evening started with Kids and Volunteers performing Aarti together in the temple. After Aarti all parents were asked to leave leaving behind just the kids and volunteers. The night saw kids enjoying group games such as tag ball, dance competition, Geographic championship, Kho and the Amazing Race. While many of the kids were playing the games, others were enjoying various activity stations like creating Chinese lanterns, nail arts and tattoos. From non-stop bouncing on the inflatables to running, jumping, dancing for the minute-to-win-it games kids were just having fantastic time. There were groups playing table tennis, doing freeze dance, karaoke and yet others were just sitting in a big circle and bonding. After so many jumping and bouncing, to calm them, we also had a soothing Yoga and Meditation session. The event was supported by 30 volunteers including members of YJA and YJP. February is going to be another exciting months starting with JSMC Computer Classes for beginners in Gujarati. For more information on activities please visit us at www.jsmconline.org or drop us a note at info@jsmcoffice.com.